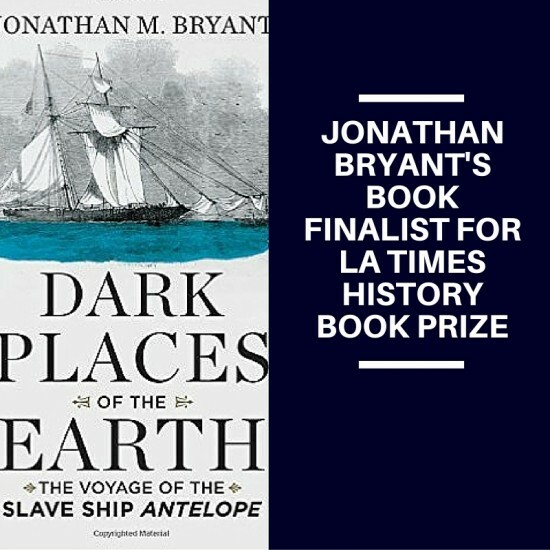 Jonathan M. Bryant’s, Ph.D., Dark Places of the Earth: The Voyage of the Slave Ship Antelope, is a finalist for the Los Angeles Times Book Prize in History. The Los Angeles Times has honored the previous year’s best books and authors since 1980 with a ceremony, this year’s ceremony – the 36th annual – will be held at the Bovard Auditorium on the USC campus. Other finalists for the award include Mary Beard’s SPQR: A History of Ancient Rome, Dan Ephron’s Killing a King: The Assassination of Yitzhak Rabin and the Remaking of Israel, David Maraniss’ Once in a Great City: A Detroit Story, and Mark Molesky’s This Gulf of Fire: The Destruction of Lisbon, or Apocalypse in the Age of Science and Reason. Bryant’s book covers the case of the slave ship Antelope, her commandeering by a privateer and ensuing legal trial that reached the United States Supreme Court in 1825. “Bryant presents a broadened picture of the transatlantic slave trade while illuminating a legal battle with huge moral implications,” said Barbara Hoffert of the Library Journal. The book is the fifth for Bryant, a Professor in the Department of History, who specializes in the history of American law, slavery, and emancipation.